When it comes to the best wearable tech devices, a smartwatch is at the top of nearly everyone’s wish list. But with the ever expanding market offering dozens of options how do you know which one is right for you? We’ve picked the best guaranteed to meet the demands of even the most exacting superyacht owner. 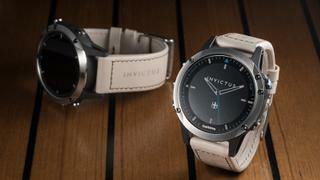 The first smartwatch to boast input from a yacht builder, Invictus Yacht has teamed up with Garmin Marine to create the Quatix 5. Designed with fishing, sailing and powerboating in mind, the watch features a 47mm display and integrated GPS and is available with either a leather or silicon strap. As well as the standard functions expected of a modern smartwatch, including a pulse rate monitor, step count, app integration, email and messaging, the Quatix 5 offers ocean-specific functions such as wireless connection to multifunction chart plotters, Garmin Marine displays and NMEA 2000 network connection allowing you to check various stats including speed, depth, temperature and wind. The Quatix 5 is also capable of connecting to GHC 20 meaning you can use the watch to activate autopilot or change course, features a special man overboard button allowing you to instantly create a waypoint on your yacht's chart plotter to find lost crew and can also access tide tables if pre-downloaded on a connected phone or tablet. French luxury brand Louis Vuitton entered the smartwatch market in July 2017 with its debut model, the Tambour Horizon. Available in six models, each resembling one of the brand's analogue watches including a particularly impressive recreation of the brand's colourful world time watch, the Tambour Horizon is powered by Android Wear and, as well as all the usual apps, offers access to exclusive content via the LA Pass app. This content includes interactive digital versions of Louis Vuitton's famous city guides and insider access to Louis Vuitton news and products making it a must for any dedicated fan of the brand. Don't want to leave your mechanical watch functions behind? The Tambour Horizon also offers customisable watch faces and chronometer and countdown apps so you can use it just like a traditional timepiece should you wish. 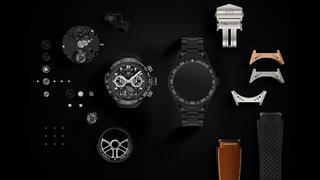 The follow-up to the popular Tag Heuer Connected, the Tag Heuer Connected Modular 45 presents a completely new concept in the smartwatch world. Offering the ultimate in versatility, the connected 'smart' module of the watch is completely interchangeable with a haute horologie Three Hands or Chronograph Tourbillon module meaning you can switch between high-tech and fine timepiece as the whim takes you. If that wasn't enough, the lugs, strap and buckle can all swapped with a huge range of colours and materials available. The ideal smartwatch for the indecisive, the Tag Heuer Connected Modular 45 quite simply offers the best of both worlds. The tech-obsessed musician will.i.am has teamed up with Gucci Timepieces to create the yet-to-be-released “smartband” – a wearable device that is a watch, voice-activated personal assistant, fitness tracker and phone all rolled into one. Impressively, the band can make and receive calls and texts without being hooked into your mobile. 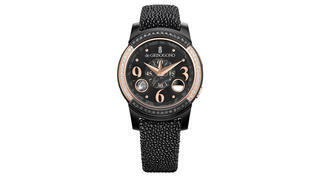 Samsung has joined forces with flamboyant jeweller and watchmaker De Grisogono to fashion this diamond-studded hybrid. It has a rose gold turning bezel to control the functions, which include a heart rate monitor and barometer. It may seem obvious but if you’re one of the thousands of people who already own an iPhone, iPad or MacBook, then investing in a smartwatch from Apple makes sense. After the huge popularity of the first Apple Watch, the tech giant has just announced a second generation of the smartwatch that puts greater emphasis on functionality for fitness fanatics. 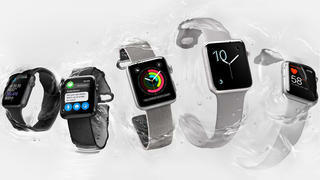 Along with all the features of the first two models, Apple Watch Series 3 puts more of a focus on sport function and includes built-in GPS, independent cellular capabilities, a heart rate sensor, a custom workout app, up to 18 hours of battery life and is water resistant to 50 metres making it the perfect gadget for your superyacht gym. 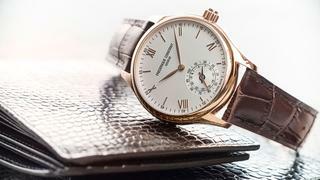 Starting with a beautiful Swiss timepiece and working backwards to incorporate new technologies, instead of vice versa, Frederique Constant’s Horological Smartwatch is the device for the true watch connoisseur. Working both autonomously and with Android and iPhone apps, the Horological Smartwatch focuses mainly on sleep and activity tracking and boasts a low-power system which will work for around 25 months on a standard watch battery. In short, its functions may be limited but with five beautiful design to choose from it sure looks good.